Prairie State Park is best known for preserving the prairie tallgrass that once covered the whole state. It only has one official trail, the Coyote Trail, although hikers are encouraged to roam through the park and enjoy the open spaces. Coyote Trail is an easy, 3.2 mile trail, and the park’s literature says that hikers might even see coyote families gamboling through the grass. Hikers report that the herd of wild bison have been known to settle in across the trail, blocking their way, but nobody has indicated they minded being displaced by these majestic, endangered beasts. Roaring River State Park is located deep in the south of Missouri, a stone’s throw from the Arkansas border. It marks the region where the foothills of the Ozarks become the true Ozarks Mountains, and even the shorter trails at Roaring River State Park take hikers up steep mountainsides to spectacular views. Fire Tower Trail is the longest of the short trails at Roaring River at 3.75 miles. It is named for the old 1930s fire lookout tower that still looms over the dense woods, about a mile and a half from the visitors’ center. The steep paths might be a little more work, but the views and experience are more than worth it. At 17 miles long, The Big Piney Trail, in the Mark Twain National Forest outside of Licking, is both one of the longer ones and one of the more challenging ones in our survey. It winds through the beautiful national forest, and is considered a true wilderness hike. Park officials emphasize the wilderness part of that description; the trail has a 500-foot rise over its distance, and there is no water available apart from what hikers can bring or sterilize themselves. Horseback riding is allowed, but however you access this majestic wilderness trail, park staff cautions you to use “leave no trace” procedures so that this beautiful piece of native Missouri may be preserved for all. Although the Ozark Trail is not quite completed, when it is finished, it will stretch over 500 miles in a diagonal line across the south-central to eastern-central corner of Missouri. Needless to say, the 350 miles that are available contain multiple trails of different lengths. One of the most famous and well-hiked of these trails is the 14.5 mile Taum Sauk trail, which is located in Taum Sauk Mountain State Park. One spur of this trail leads to Mina Sauk Falls, the highest waterfall in Missouri, and circles around to make a 3 mile loop back to the main trail. It’s one of the most scenic and best-loved trails in the state. There are 5 hiking trails at Ha Ha Tonka State Park, each of them fairly short and local, totaling only 15 miles of trail between them. But few places can offer such arresting scenery in such a small area. The Castle Trail is only 1.5 miles long, but leads hikers over hills, through woods and open areas, and to overlooks where information is available about the scenery and the area. Most notably, this wheelchair and stroller accessible trail leads to the ruins of a 20th century castle, set high on the bluffs over Lake of the Ozarks. Other trails at Ha Ha Tonks take hikers over boulders, under natural bridges, or along the lake. It’s one of the most intriguing locations for hiking in the state. Bennett Spring Park has 7 hiking trails, from the 70-mile Bridge Trail (named for a bridge that no longer exists) to the tiny 1/3 mile Oak Hickory Trail, but by far the most famous and sought-after trail is the Natural Tunnel Trail. This is a 7.5-mile trail that routes through the 296-foot long Natural Tunnel. It includes several other points of interest as well, including two small family cemeteries, and natural shelters that settlers may have used as they passed through the area. 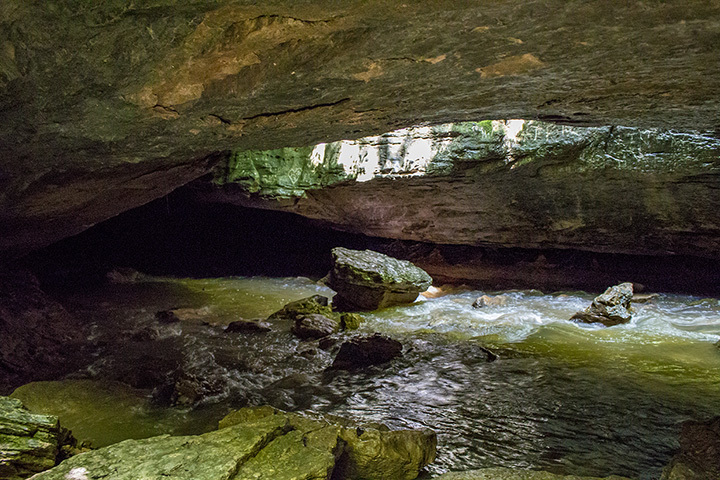 Gans Creek is an 8.5 mile trail found off one of the shorter trails in Rock Bridge State Park outside of Columbia. It is open to both hikers and horse riders, although horse riding is only permitted during the summer and fall. The Gans Creek trail passes near Gans Creek, and the presence of high bluffs along the trail highlight the waterfalls running into the creek. The trail is only minimally maintained by park staff, in order to optimize the experience of an extended hike through unspoiled Missouri nature. This 36-mile trail is found in south central Missouri, near Rolla. This section of the Mark Twain National Forest covers 16,000 square acres, and the Cedar Creek Trail that winds through it takes hikers through both forest and prairie. It is divided into 4 sections, and different sections permit pets, mountain bikes, and even horses. The Lewis and Clark Trail is actually two separate moderate-length trails: Lewis is 7.4 miles and Clark is 3 miles. They are found in the Weldon Creek Conservation Area, in St. Charles, which is right outside of St. Louis. The Lewis Trail is a longer loop, and but if hikers turn off onto the Clark Trail, it will take them right out onto the bluffs overlooking the Missouri River. The whole hike is beautiful, but this view is considered one of the most stunning in Missouri. The Katy Trail is over 240 miles long, and until recently stretched from Clinton, MO, to St. Charles. A new segment of the Katy Trail is currently being built that will extend the trail from Clinton northwest to Kansas City, which will mean the trail will soon extend across the state. The Trail was built along on donated land which used to be a train route, and has several entry points, including Clinton, Machens, and Rocheport, MO. For the eastern 2/3 of the trail, it follows the path of the Missouri River, which gives it some of the most spectacular scenery and variety in the state. The Katy Trail is used by hikers, joggers, and bikers, and some hearty souls even undertake to hike or ride the entire distance—a feat which is about to get more challenging! View more Missouri Hiking Trails.